CAPE ELIZABETH—The Rams and the Capers traded blows through the first half of their tournament semifinal on Saturday afternoon, June 9, Chris Tucker kicking in two for Gorham en route to a 3-3 deadlock at the break. Cape logged a huge third quarter, though – the team added six in the stretch, including three consecutive by Jake Brydson – to pull away; they would win in the end 12-4. The sides wrestled for control of the scoreboard for the first 24 minutes: Tucker hashed a pair, with one by Dom Lorello stuck in between, but all the while, Cape was tallying too. Tate Perkins, Phillip Tarling and Archie McEvoy notched one apiece for the home team, setting up a nervewracking intermission. The tension completely unraveled in the third. 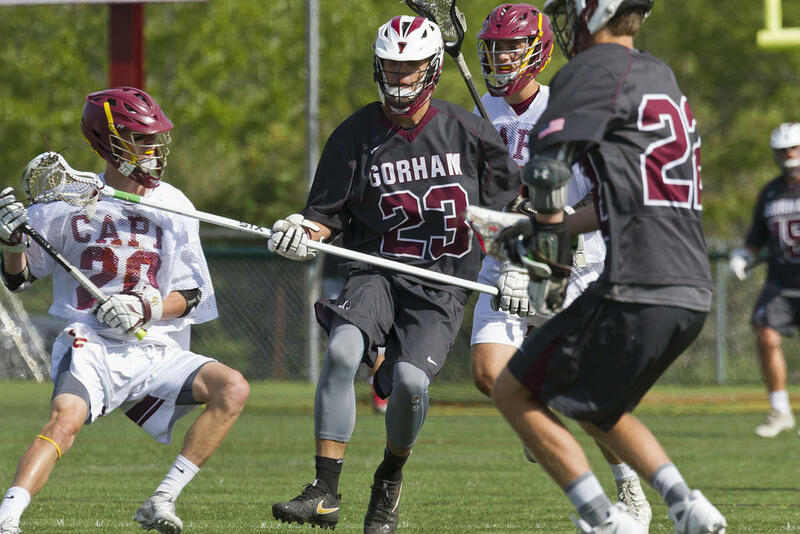 Cape won the initial faceoff and quickly settled into an attacking pattern; the Capers poked and prodded at the Rams’ defense, and soon tested second-half Gorham goalie Guiseppe Brown multiple times. The Rams stood stalwart for several minutes, but even the toughest squads will collapse under constant pressure, and Cape finally converted with 8:52 on the clock. Ben Carroll did the honors, ticking the scoreboard ahead to 4-3 – and, evidently, seizing the momentum for his boys, because they followed his strike with six more. Tarling made it 5-3; Brydson 6-3, 7-3 and 8-3. Tarling then picked up another – he finished with five on the day – with mere seconds remaining in the third. The Rams managed to stanch the bleeding in the downhill quarter. Gorham gave up just two more before the final buzzer – one each to Killiam Lathrope and Tarling – while also adding one of their own, thanks to Connor Dougherty. Brown might’ve given up six in the third quarter alone, but “Those weren’t his fault,” as Jones put it. “Those were guys on the doorstep. And Cape knows how to score.” Also to Brown’s credit, he turned away four or five other would-be goals in the same stretch. For those 12 minutes, he was essentially the only thing keeping his boys in the game. “We were without our faceoff guy today,” Jones went on. “That hurt us a little bit on possessions. But guys stepped up. We had a freshman step up and take some faceoffs today, Beck Carrier. 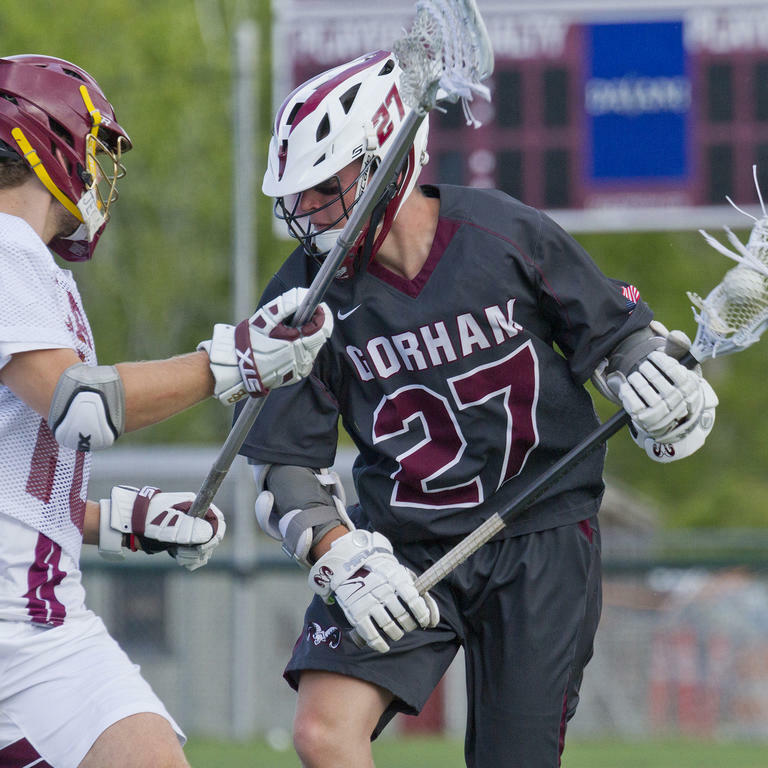 “I thought our defensive middies played really well – and they were trying to go at them. Adam McKenney, Nate Hotham, Jacob Benson, Sam Burghardt, Jared Heddesheimer and Will Dipietrantonio. They all played really well. Gorham concludes their 2018 at 6-8. The Rams went 5-7 through the regular season to sneak into the bracketing ranked sixth in A South; they upended three-seed Massabesic 14-9 in the quarters to meet No. 2 Cape. For their part, the Capers jump to 10-3. They travel to No. 1 Thornton for the Regional Championship on Wednesday the 13th. Rams Captain Sam Burghardt drives forward. Dom Lorello looks for a way around a Cape defender. Caper Jack Glanville and Ram Adam McKenney battle for a faceoff. Rams netminder Guiseppe Brown scoops up a ball on his doorstep. Holden Edwards defends for Gorham. Gorhamite Nate Hotham tracks alongside a Cape opponent. Caper Sam Dresser and Ram Will Dipietrantonio clash. Caper Phillip Tarling – who finished with five goals – scoots around the attacking perimeter; Gorhamite Jake Benson defends.